Language Marketplace provides timely on-demand phone interpreting services for organizations and businesses requiring easily accessible verbal language translation services at very competitive rates. 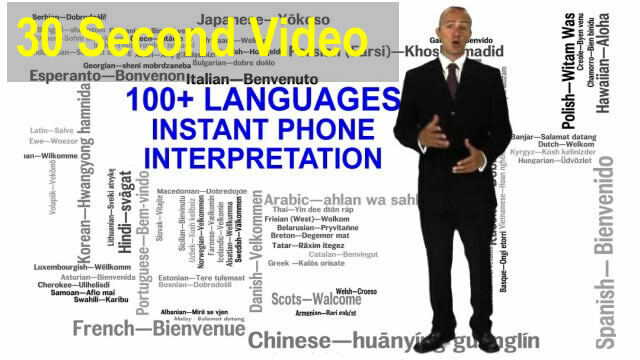 Connecting with your interpreter to assist with your telephone call occurs on average within 30 seconds! We currently offer Spanish, French, Polish, Czech, Chinese, and Portuguese among the110 languages we offer. For those organizations working in the French language, we also offer these same great on-demand phone services for over 40 languages - a great way for French organizations to be inclusive irrelevant of language! Our on-demand phone interpretation services are available 7 days a week, 24 hours a day. Effective on-demand communication is required in a global business environment and in today’s multicultural, multi-lingual environment we live in. Cost savings is important to every organization and business. Access to Language services is more important than ever. Language Marketplace's instant phone interpreting services (often called Instant Translation) realized this need and provides a cost-effective strategy for all your on-demand interpretation needs. All of our interpreters are trained professionals and adhere to standardized interpreting codes of ethics at all times. Our on-demand telephone interpretation services can help you and your client communicate over the telephone as and when needed. As one of the fastest growing translation and interpretation services provider in North America, we can help you with all your communication needs, on-demand, over the phone. We literally "empower" you to speak any language in seconds, 24/7/365. Call now to see how fast, easy, and cost-effectively you can get started now. Our Phone Interpreting Service Attitude! Language Marketplace® is a certified translation and interpretation service provider. We are known for our superior service. When using our on-demand phone interpretation services, all your requests are handled promptly and efficiently. All our interpreters are trained professionals and all our interpreters live and work in North America. Our interpreters specialize in; medical, legal, social services, health, and other Government and corporate services such as call centers. Our process is easy and efficient and we keep in mind that time is also sensitive. Our rates are based on per minute usage and are the most competitive in the industry. Our Phone Interpreters (often called Instant Translators or on-demand translators) are experienced and trained professionals living in North America! We offer volume usage discount rates at far lower minimum entry values than any competitor! Our Phone Translation List of Languages Includes: Albanian, Armenian, Bosnian, Bulgarian, Catalan, Croatian, Czech, Danish, French, Canadian French, Georgian, German, Greek, Hungarian, Icelandic, Italian, Kurdish, Latin, Norwegian, Polish, Portuguese, Russian, Romanian, Serbian, Slovak, Slovenian, Spanish, Swedish, Turkish, Ukrainian, Assamese, Bengali, Burmese, Cambodian, Chinese, Dari, Gujarati, Hindi, Indonesian - Bahasa, Japanese, Kannada, Khmer, Korean, Laotian, Maithili, Malay, Malayalam, Marathi, Punjabi, Pushto, Singhalese, Tagalog, Tamil, Telugu, Thai, Vietnamese, Urdu, Arabic, Farsi, Hebrew, Afrikaans, Amharic, Hausa, Somali, Swahili. Swampy Cree, Plains Cree, Woods Cree Translator, Inuinnaqtun, Ojibway (or Ojibwe), and Inuktitut. Click here for our phone interpreters for French language based organizations - over 40 instant phone interpreters whom also speak French! "This is EXCELLENT service! I'm very impressed with your company, and am very pleased with my colleague's recommendation"
"You guys have done a GREAT JOB! Much appreciated." "AMAZING! You guys are GOOD!"